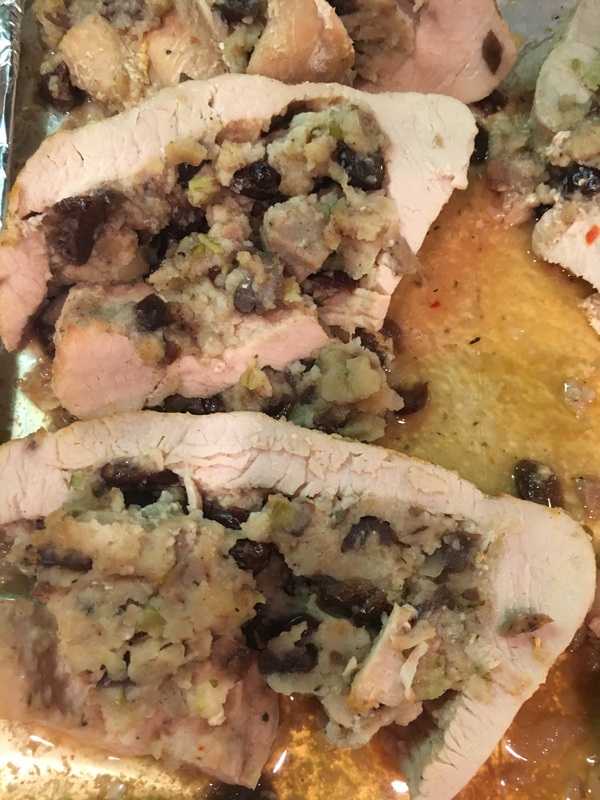 Stuffed turkey, mashed potatoes, yams, grilled green vegetables, pumpkin pie and more delicious yummies made this week’s Thanksgiving Day a tummy-filling, yummy-tasting experience! Holiday celebrating began early for me with Southern California sightseeing with a best friend. Careless indulging was not an option on my priorities during this festive season. Favorite foods were prepared with wonderful seasonings, minimal salt, and low sugar for the healthy-conscious attending our friend gathering. Yams (recipe below) made it on the menu, and the easiest slow cooker recipe ever made cooking on my part totally stress free. Black Friday arrived, and I hadn’t gained five pounds overnight as in the past. In addition, I made it throughout the busiest shopping day of the year with the best deal ever, stress free, and relaxed. How? I didn’t spend a cent. It’s been awhile since I blogged. I went on a pre-holiday vacation with one of my best friends. We took in as much as we could fit into each day, had a blast, and laughed like giddy little girls. If you’ve thought about doing a Southern California holiday vacation and San Diego is included in your places-to-go list, next month could be the perfect time to go. The panda bears are expected to return to China in 2017 (according to what we were told at San Diego Zoo). 1. Visit San Diego Zoo. 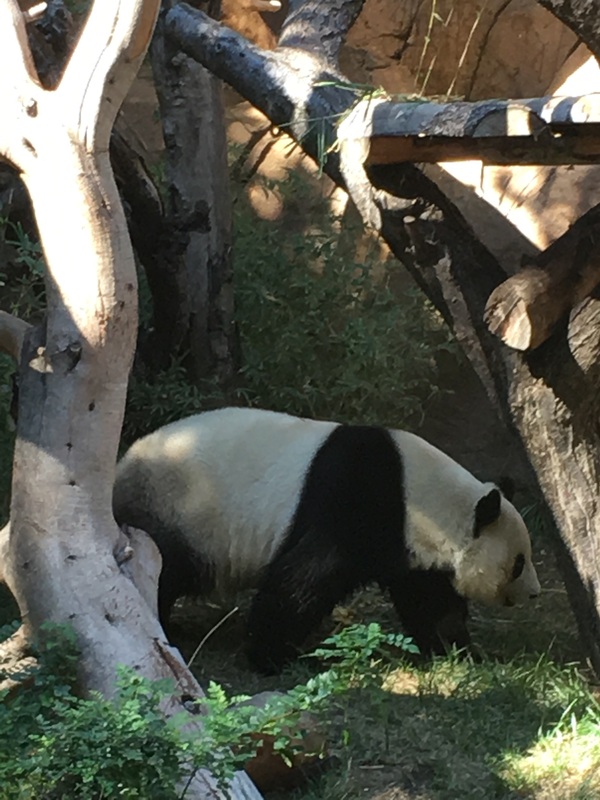 Starting at San Diego Zoo , we LOVED the pandas on loan from China. The Bears are expected to return home soon, so we were ecstatic that we got to see the black and white huge beauties. 2. Bring comfortable shoes to walk and work out in. We got a workout to boot on the panda bear trail – uphill, exercising leg muscles that had been taking a l-o-n-g break from exercise. Taking in San Diego beauty from the zoo’s Skyfari gave our leg muscles a rest. My friend Doris and her dad have always loved animals, and her dad had passed only a month before. So our zoo day became a healing balm to her emotions. Funny, cute, little, huge, and all kinds of animals provided an enjoyable, care-free day – well, except that Doris dropped her phone before we even paid for our tickets. The good thing is her phone, though cracked, worked just fine for the remainder of the trip. Notice my mention of the grilled green vegetables at the beginning? This vacation included healthy veggies, snacks (like my favorite Ding-Bat Bars), and pre-grilled barbecue chicken (plus grilled eggplant) that I brought, thanks to my husband, the chef. 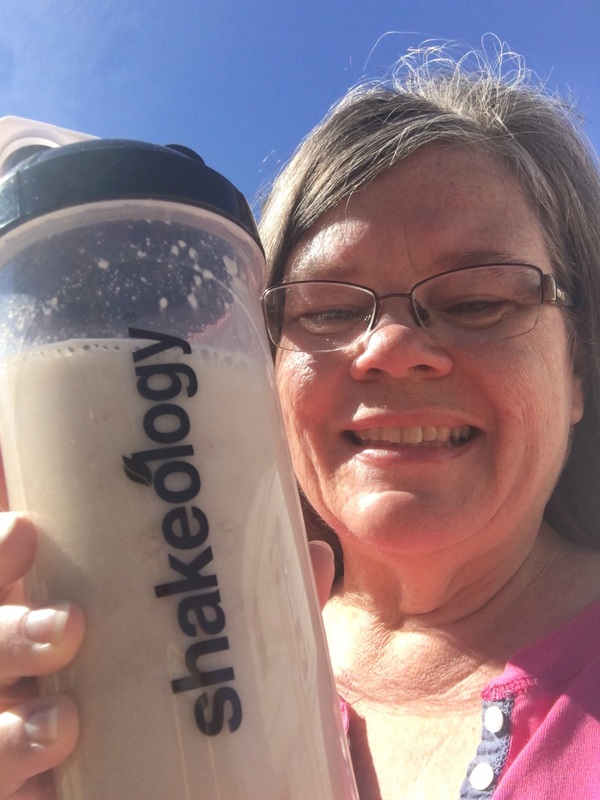 Our menus consisted of important proteins and nutrients, Shakeology, grilled chicken, fish tacos, grilled eggplant, veggies, fruit, and, of course, breakfast (you know that’s my favorite meal of the day). Both of us were delighted to have a free breakfast at our San Diego hotel. 3. Bring a workout DVD and portable DVD player. You’ll get a lot of walking in, but workout DVD’s such as Pilates, upper body, and lower body can help you stay fit for the trip – and knock off extra calories you may take in. I brought my 21-Day Fix DVD. The workouts along with a lot of walking provided the necessary exercise needed for my Fit For Your Purpose journey. That is about a lifestyle change I embarked on this past summer to improve my health. If you are concerned about making better health choices and would like to know more, I’d love to share my story with you. 4. See the Pacific, walk on the beach, wade in the ocean. 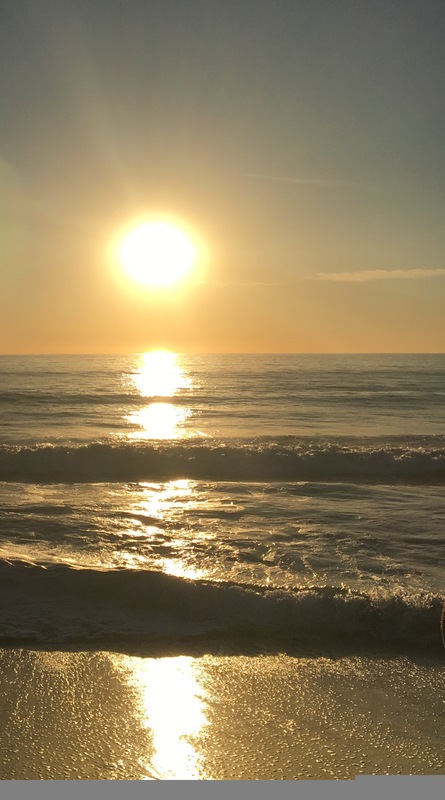 Drive up to LA from San Diego on Interstate 5, and stop at Carlsbad for Starbucks, a sandwich, and a walk to the beach. You can find free parking by the Starbucks and sandwich shop. Eat a bite, get your coffee, and walk across the street and about a block, then down the steps to the beach. We stopped here, and it was a delightful break, especially since it was the first time Doris had seen the Pacific. 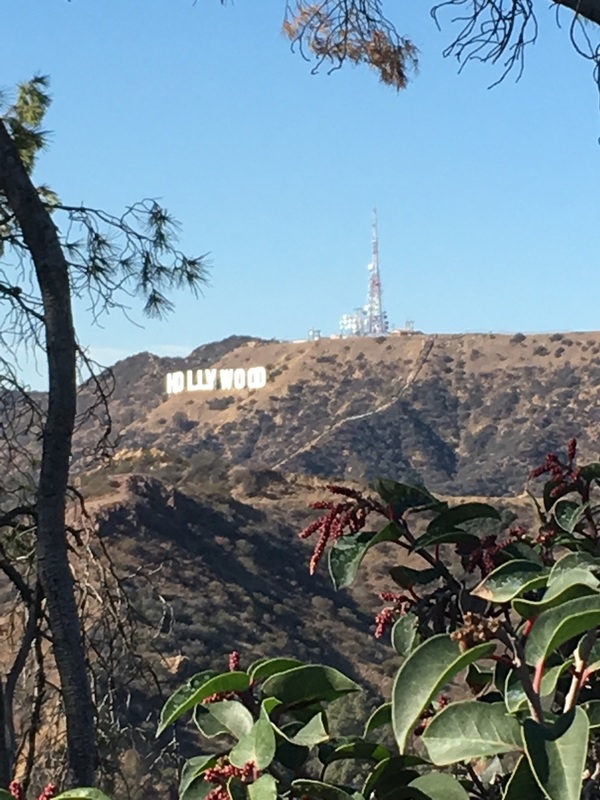 The Observatory in Griffith Park is free admission, and the parking is free. You can see the city of Los Angeles and the famous Hollywood sign. Headed for Los Angeles after San Diego, we couldn’t resist a few hours at a beach on the Pacific. Then we got to experience the forever-crowded LA traffic. 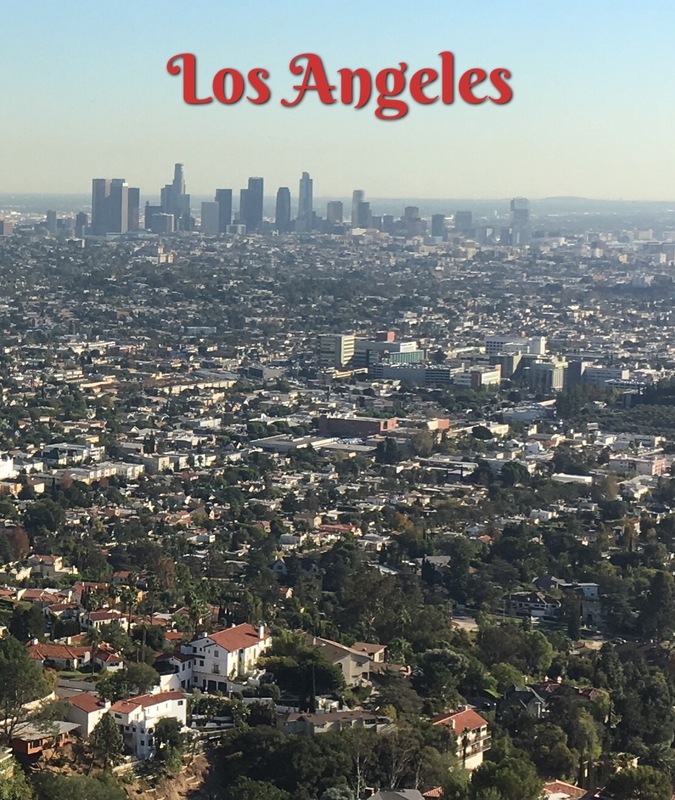 We visited the magnificent view of Los Angeles and the famous Hollywood sign from the Observatory in Griffith Park. Travel on Route 66, visit museums and an Old West ghost town. 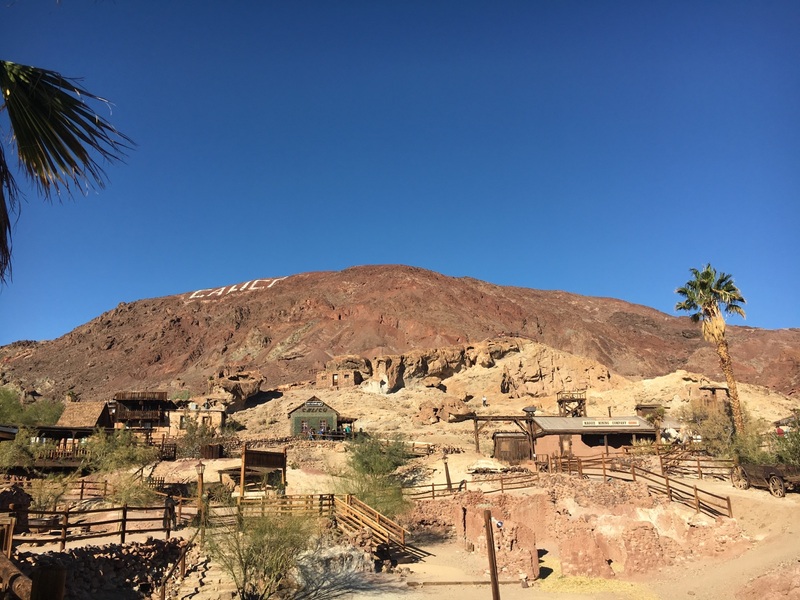 Calico Ghost Town costs $8 per adult (see website for additional fees, information, and information). Roy Rogers and Dale Evans lived in the Apple Valley area of So Cal’s High Desert and are buried there. Fans can stop by Apple Valley to see the graves and also do some vintage shopping at Antique Station where you can find Roy Rogers and Dale Evans memorabilia. The Antique Station is located in Oro Grande, and there are several vintage shops nearby and fabulous pizza at Cross Eyed Cow Pizza. Or eat at the Emma Jean’s Holland Burger Route 66 diner established in 1947. Our vacation was continued to the High Desert, up the Cajon Pass where the Blue Cut Fire had come through in August. We spent a day seeing Barstow Harvey House and Rail Depot, Route 66 “Mother Road” and Western America Railroad museums, and Calico Ghost Town, an old West mining town. 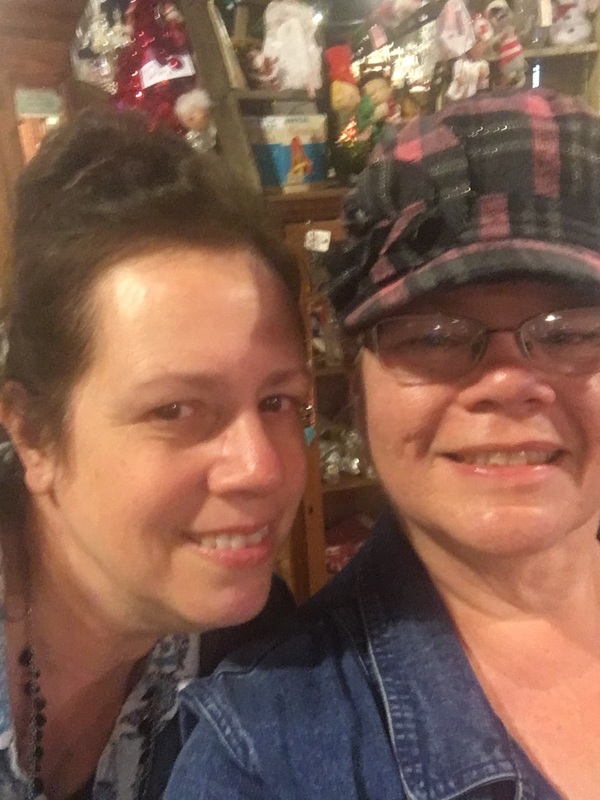 And we vintage shopped at a classy antique store, Carriage House Antiques. 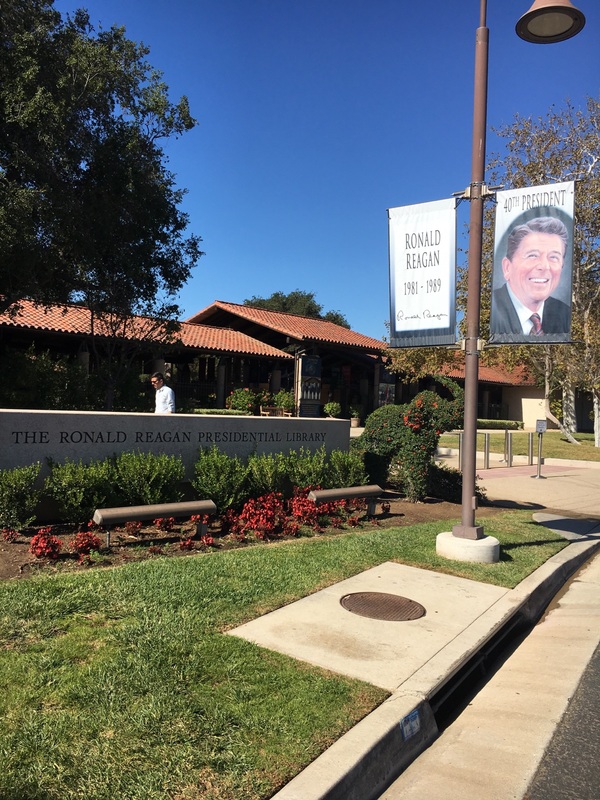 Two other friends joined us on Monday, November 14th, to go to the Ronald Reagan Presidential Library and Museum. Admission is $21 for adults (less for seniors, youths, children and free for toddlers/infants), and parking is free. This was an all-day trip and well worth it. For those in our group who love Christmas, the Christmas Around The World exhibit (continues through January 8th) was an added treat. This exhibit includes 26 beautifully decorated trees (and a White House Tree) representing countries President Reagan visited when he was in office. The Reagan Museum is an incredible place to visit. You can tour the Air Force One aircraft, tail number 27000, and see a full-size replica of the Oval Office. There is so much to see at the museum, and you can enjoy lunch at the Reagan Country Cafe or Ronald Reagan Pub. Vacation came and went. 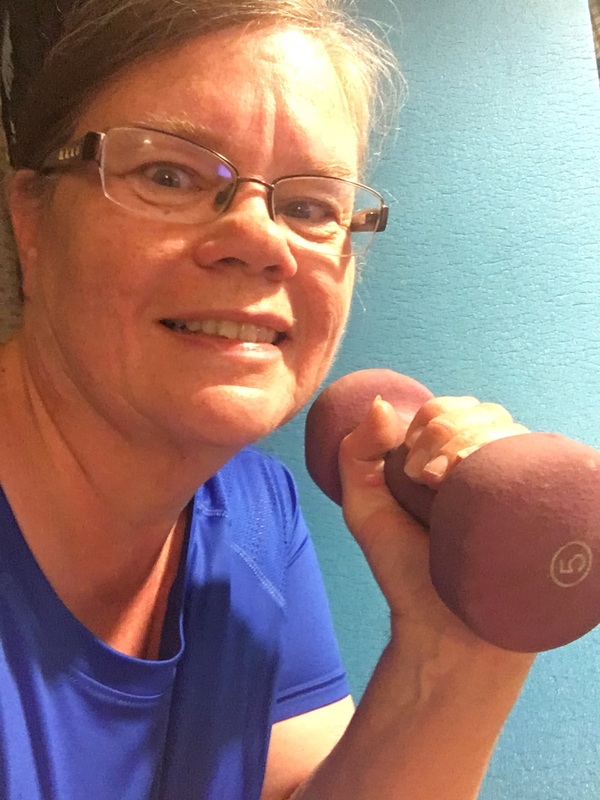 Thanksgiving arrived, and I was determined to press through the holiday week with more workouts and healthy eating. I stayed on track and am feeling great. That wasn’t so for many holiday seasons in the past. I thought I had to have everything I loved to eat, at least a little, and surely had no plans for daily workouts. However, a little of this and that fills up a whole plate and more. That’s all changed now. Instead, I drink my Shakeology daily and keep my weights nearby, my workout DVD ready to play, and stay on my fitness journey. You can make it through the holidays without feeling miserable about yourself. Get active, plan your meals, and look for ways to be fit. 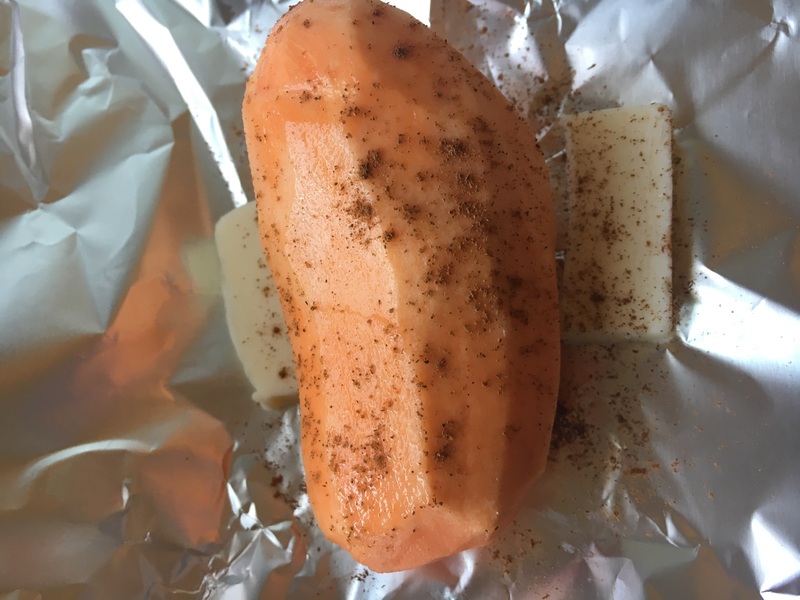 Place each yam onto a sheet of foil. Sprinkle cinnamon liberally all over each yam. Slice a tablespoon of butter in two halves, and put one half on each side of yam lengthwise. Wrap yam in the foil, sealing the top and ends, then place it into the slow cooker. Thank you for stopping by today to see what’s up at Kitchen Southern Hospitality! I’ve never tried baking whole yams in my slow cooker, but I’ve done chunks. I can’t wait to give this a try. Do you think that I could cook the yams in the slow cooker without the butter and cinnamon? I want to mash them up afterwards to use in a pie. I’m sure that you can. Try it, and let me know how yours turns out.